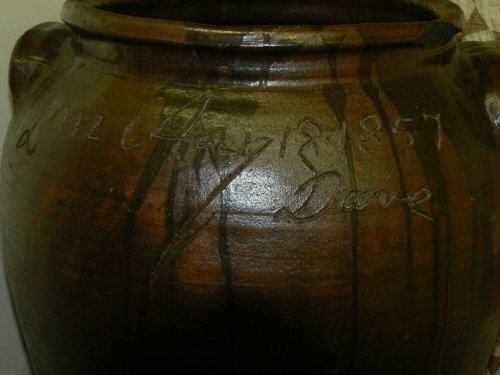 This jar features the signature of its maker, Dave. Dave was among the relatively few literate slaves in South Carolina, and he used his skills to not only sign and date his work, but occasionally to inscribe larger pieces with rhymes or poetry. This piece was made on August 15, 1857. The initials “Lm,” which references one of Dave’s owners, Lewis Miles, are written just before the date.